BenMar Farm is excited to present Purebred Irish Draught Foals and Irish Draught Sport Horse Foals by our stallion Bridon Belfrey, RID. Please click on the photos or links to see more. Horses on this page are by Bridon Belfrey, RID and out of client mares. BenMar Farm is overjoyed to announce the birth of our stallion’s first sport horse foal! 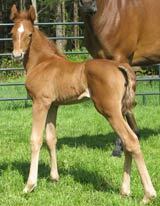 BenMar’s Bridon Belfrey, RID is the proud Papa of Briette, IDSH, a stunning liver chestnut filly. She is out of a bay maiden Anglo-Arab mare, Katie’s Treasure, owned by Jenna Ordway.